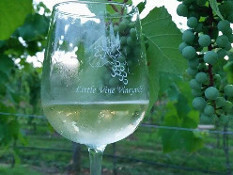 Little Vine Vineyards and Winery in Villa Rica, Carroll County, GA is bringing back a tradition of fine wines once produced in Western Georgia in the 1890's. This area of the state at one time was a major vineyard and winery center with some 20,000 acres planted in bunch grapes before prohibition. 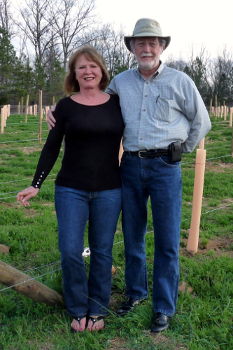 The grapes at Little Vine Vineyards are the first commercial wine grapes planted in West Central Georgia since 1907 and the winery is the first constructed here in over 100 years. Just as Villa Rica was home to the nation's first gold rush in 1826, Little Vine is striving to reestablish the golden era of wine making here after a century long absence. Little Vine Vineyards began preparing the soil for planting in 2010 and planted the first grapes in March 2011. 700 Norton and 700 LeNoir (Len-Wah) grape vines were planted on the first three acres to start the re-birth of the wine industry. Friends, neighbors, our church life group members and Vineyard and Winery Association members joined in a day long planting. This was a new and exciting undertaking for everyone present, especially the owners, Jerry and Sherrie Culver. The second three acres were planted a year later in 2012. 900 Blanc du Bois, 350 Villard Blanc and 55 Herbemont grape vines were planted at that time. Once again, friends, neighbors, our church Life Group members, Vineyard and Winery Association members joined in the planting. And again, this was an exciting day of activity. There was great anticipation of what great wine these vines could produce. The fruits of labor were realized the following year in 2013 with the first harvest. The first three acres produced approximately 9.5 tons of grapes. One half ton of Blanc du Bois grapes were harvested from the previous year planting. This day was more exciting than the planting days because we could actually touch, feel, see and taste the fruits of our labor from the previous years. There was great anticipation of the great wines that would come from these grapes. The day was celebrated with good wine, good food and most importantly great friendships nurtured by the sweat of our brow and the dirt on our hands. Harvest days in 2014 yielded 20 tons of grapes with seven tons of Blanc du Bois, five tons of Norton, one ton Villard Blanc and seven tons of LeNoir. Once again friends, neighbors, our church life group, vineyard association members and some hired labor participated in the harvests. There were three separate harvest dates in 2014. It was a fantastic effort on the part of our friends and neighbors for which we are truly grateful. Harvest days in 2015 yielded 25 tons of grapes with six tons of Blanc du Bois, one ton of Villard Blanc, six tons of Norton and twelve tons of LeNoir.